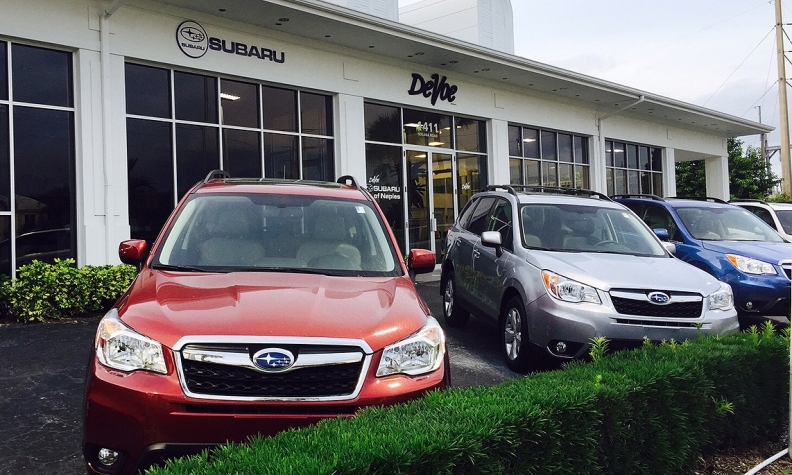 April was the 14th consecutive month Subaru's U.S. sales topped more than 40,000 vehicles. TOKYO — The maker of Subaru vehicles, Fuji Heavy Industries, reported a 21 percent surge in operating profit in its latest quarter as advantageous exchange rates and surging sales delivered record earnings. The all-wheel-drive specialist also said it would meet its North America sales target five years ahead of schedule and speed up plans to increase local production capacity there. Global operating income climbed to 112.9 billion yen ($943.7 million) in the company’s fiscal fourth quarter ended March 31, Fuji Heavy President Yasuyuki Yoshinaga said today while delivering fiscal-year financial results. A 41.6 billion yen ($347.7 million) windfall gain from the depreciating yen helped drive earnings higher. The foreign exchange gain alone was more than twice the amount of the increase in quarterly operating profit, indicating that without the tailwind, operating profit likely would have fallen. The yen’s decline against the dollar aids Japanese exports and increases the yen-dominated value of dollars earned overseas. Increasing sales, especially in North America, also fueled the results with global volume advancing 6.6 percent to 247,000 vehicles in the three months, from 231,700 units a year before. Quarterly net income nearly tripled to 71.5 billion yen ($597.7 million), from 25.1 billion yen ($209.8 million). Global revenue rose 17 percent to 817.2 billion yen ($6.83 billion), from 699.6 billion ($3.50 billion). Stellar performance in North America paced Subaru’s march. The U.S. alone accounts for about 62 percent of its global sales. In the latest quarter, U.S. sales rose 12 percent to 128,900 vehicles. In Japan, by contrast, sales slid 1.4 percent to 56,900, while China volume fell 14 percent to 13,100 units. Citing brisk North America demand, Yoshinaga brought forward plans to boost production capacity at its Indiana assembly plant and predicted Subaru would hit North America regional sales target of 600,000 vehicles five years ahead of schedule. It now targets 600,000 units in the current fiscal year ending March 31, 2016. Just a year ago, it had aimed to sell that many in the U.S. and Canada in the fiscal year ending March 31, 2021. North America sales rose 19 percent to 570,000 units in the just ended fiscal year. Fuji Heavy had predicted in January that Subaru sales in the U.S. would climb 5 percent to 540,000 in calendar year 2015, for a seventh-straight record year. For the current fiscal year ending March 31, 2016, Fuji Heavy now predicts U.S. sales of 554,000 vehicles. To supply the upswing, Yoshinaga said he would boost annual production capacity at Fuji Heavy’s Lafayette, Ind., plant to 394,000 vehicles by the end of calendar year 2016. "If only we had more cars, we could be selling more," Yoshinaga told a news conference, noting that inventory levels in the United States remained too low. The company had earlier planned to raise capacity there to 328,000 by the end of next year and possibly lift it again to 400,000 in the fiscal year ending March 31, 2021. That plant will start making the Impreza small car next year. On an annual basis, Fuji Heavy bounded forward to another fiscal year of across-the-board record results, including record unit sales, record revenue, record operating profit and record net income. It chalked records in all those categories as well in the previous fiscal year ended March 31, 2014. Revenue increased 20 percent to 2.88 trillion yen ($24.07 billion). Global sales grew 10 percent to an all-time high of 910,700 vehicles. North America sales increased 19 percent to 570,000 vehicles in the fiscal year just ended, another record. Looking ahead to the current fiscal year ending March 31, 2016, Subaru expects more record results. Net income should grow 29 percent to 337.0 billion yen ($2.82 billion) in the current fiscal year on an 5.3 percent surge in sales to 3.03 trillion yen ($25.33 billion). Operating profit is expected to advance 19 percent to 503.0 billion yen ($4.20 billion). The company predicts global unit sales to increase 1.9 percent increase to 928,300 vehicles. Earning will get a big boost, despite the meager sales increase, from exchange rates that Fuji Heavy expects to swing to an even more advantageous position this year. Yoshinaga is piloting a business plan for further expansion through 2020 that calls for new products, better engines, more production and cost cutting. Starting in 2016, Subaru will introduce a new modularized platform called the Subaru Global Platform that will support every model from the Impreza to the Outback. It will debut in the next-generation Impreza and be engineered with a focus on safety, maneuverability and interior space. Among the new products on tap is a seven-seat SUV geared toward the North American market to replace the aging Tribeca. Subaru will also convert all its gasoline engines to direct injection, starting the same year. The technology will be standard in a next-generation boxer engine Subaru will roll out. Subaru will also introduce a plug-in hybrid for North America, to meet U.S. zero emissions vehicle regulations taking effect in 2018. That model will be based on Toyota hybrid technology. The mid-term plan aims to shore up profits by slashing unit costs 20 percent by 2020. The savings will largely come through reducing material costs through more efficient vehicle designs, standardized platforms and leaner manufacturing processes.